Fine artwork with scratchboard tools has moved from the gallery to the museum and gifted artists have added this graceful, labor-intensive art to the world of oils, pastels, watercolors, and acrylics. The scratchboard medium embraces accomplished artists from around the world whose tools and supplies include not only brand-name implements that cater specifically to the art form, but also an eclectic mix of implements borrowed from other professions or homemade tools from the artists themselves. Whether you're an absolute beginner or a seasoned pro, there are cutters, like some of the Slice products, that make scratchboard art easier, more comfortable, and more precise. Their innovative ergonomic design, safety blades, and precision control make these tools ideal additions to your scratchboard set up. Scratchboard artists who already use the Slice tools as part of their arsenal find that the tools make the demanding and tedious process of creating scratchboard art easier, less time-intensive, and less stressful on their hands. Scratchboard art is an etching process that invites experimentation with a variety of cutting, scraping, or rubbing tools. The medium itself is a three-layer scratchboard, also called scraperboard. A bottom layer of Masonite or other hardboard provides a sturdy, stable backing. A layer of white kaolin clay, mixed with water, glue, and white pigment, is applied to the backing and then dried and sanded. The white clayboard is essentially the canvas for scratch art tools. You can also find scratchboard with metallic, holographic, or multi-colored layers rather than white clay. The smooth colored layer is then coated with deep-black India ink, consisting normally of fine-carbon pigment that is resistant to fading from natural sunlight, providing an archival-friendly surface. The piece of scratchboard art itself often requires hundreds of hours of work to etch the thousands of strokes that give the pieces their lifelike detail. All etching tools for scratchboard art create either fine lines and fine dots or broader brush and rubbing strokes. The fine lining and the fine dots, or stippling, are the precision strokes that bring a subject to life. Artists may apply the strokes individually, or use them in tandem to create cross-hatching or an immersive, blended texture. Master artists from the International Society of Scratchboard Artists (ISSA), among the most recognized scratchboard artists in the world today, indicate the wide array of etching implements used as scratchboard art supplies. Threads from forums and other commentary reveal that many novice artists believe the best tools are homemade—a pin attached to a mechanical pen holder, cobalt deburring blades stuck in dowels with a pin vise, or a set of CNC cutting pins from computer-programmed template prototyping machines. However, the safety, comfortable hold, and easy control offered by Slice cutters means that they are rapidly gaining popularity among enthusiastic amateurs and professional scratchboard artists alike. The tools have a clean, smooth edge, so artists can apply a precise amount of stippling or fine-line pressure, else risk spoiling the art piece or even injuring a hand. Tools should be ergonomic, reducing stress on the hand given the thousands of etching strokes that go into each scratchboard art piece. Tools should be durable, so artists can stay at their work, without having to re-sharpen blades, replace them in their holders, or throw the blades away for new ones. It’s also clear, based on comments from master artists, that it is the nature of all artists to search for and experiment with more efficient tools and to add new, innovative ones to their scratchboard tool kit. Many Slice tools are well-suited to use in scratchboard art, but two really stand out. The Precision Cutter and the Craft Knife. Like all Slice knife tools, the blades consist of hand-ground zirconium oxide. The blades are harder than steel blades and they retain their sharpness, on average, 11.2 times longer than steel blades. Precision blades retain their edge far longer than steel. The ergonomics of Slice cutting tools are part of each step of tool design. This is important to dedicated scratchboard artists who labor for hundreds of hours on projects. This fine-point scratchboard tool with reinforced top ridge is a smart choice for stippling and other fine detail work. The micro-ceramic safety blade stays sharp an average of 11.2 times longer than steel blades. It's safe, too, as the ceramic blade won't scratch or break skin without significant force being applied. Straight and curved blades available with fine-line scratchboard tool for increased versatility. Watch this video of Paul Hopman, an award-winning scratchboard artist of animal art. He’s using the Slice Ceramic Blade Craft Knife in several art production scenes in the video. Ann Ranlett, is another ISSA master artist renowned for her wildlife, pets and nature artwork. 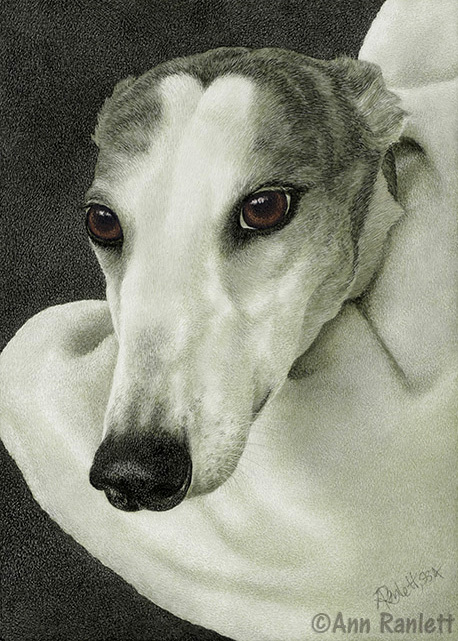 Her subject matter lends itself readily to scratchboard art because of the detail required to depict animal fur, feathers, hair, and eyes in photographic realism. One of Ms. Ranlett’s preferred etching tools (although she endorses none) is Slice’s ceramic cutting tool, noting its effectiveness for delicate "whiskering," in particular. The following image is her scratchboard piece, “Safety,” the silver award winner of the Masters’ Division at the sixth annual (2016) International Society of Scratchboard Artists’ Exhibition. It demonstrates the fine whiskering detail achieved with the right tools.